This week, I had the opportunity to be on Grape Encounters Radio program again. The host, David Wilson, is a longtime friend, and follower of this blog. He had read last weeks article about Barbera, and thought it might be an interesting subject to discuss on his radio program. The show will air on Saturday, August 3rd. Here is the podcast. As we discussed Barbera, the topic turned to one of David’s new favorite wines: Amarone. I haven’t done an article about this unique Italian wine, so this week, I share some of the basics you might want to know. To understand Amarone, we need to first take a look at Valpolicella. This is probably the most recognized wine in the Veneto region of Northeastern Italy. Valpolicella translates to “valley of many cellars”, and is made from a blend of grapes: Corvina, Rondinella, and Molinara. I’ll talk briefly about each grape in a bit. 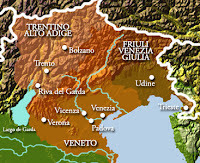 The best wines come from a series of ridges and mountain valleys (the 4 valleys—Garganago, Fumane, Marano, and Negrar constitute the “Classico” zone which is about half of the total area of Valpolicella). While the “Classico” zone would indicate that these are classic examples of the wine, there is no guarantee of quality. It still comes down to the terrior and the winemaker. As I said earlier, Valpolicella is a blended wine. Usually consisting mainly of the Corvina grape, plus Rondinella and Molinara in supporting roles. Corvina is the most important grape, due to the aromatics it contributes: floral and dark cherry notes. It is, however, low in phenolics (color and tannin), and also high in acidity. 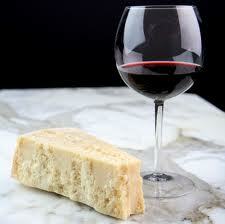 Rondinella has firmer tannins, is higher in sugar and in color than Corvina, which helps balance the wine. 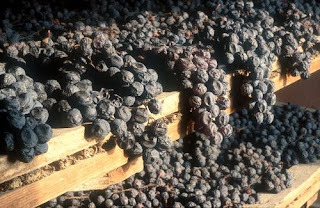 Rondinella is also important in the production of Amarone, as you will see. Molinara is the lost partner in the blend. It really doesn’t add much to the blend, except as a filler. The classic style for Valpolicella is straight-forward: bright, occasionally sour cherry fruit, pleasant, refreshing acidity and light-medium body, and not really taken seriously. That’s where Amarone comes in…. …Amarone (classically known as Amarone Della Valpolicella) is an appellation for a stylistic technique, and the zone is identical to that of Valpolicella, including the classic zone. 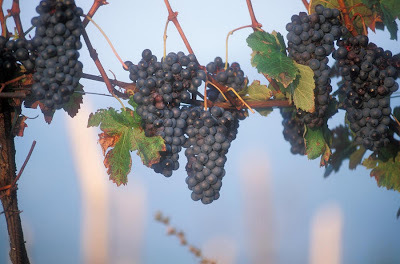 Because of the international success of Amarone, the best grapes in the region are reserved for this style of wine (it is difficult to make first-rate wine from second-best fruit, hence the reason for regular Valpolicella being second rate). So what is that “stylistic technique” that makes Amarone so special? Amarone is a “passito” wine. It has gone through a process known as “appassimento”. The process involves drying grapes to concentrate their sugars and flavoring components. During the process, which may take anywhere from several weeks to several months (though 3 months is common) depending on environmental factors and the desired wine style, the grapes suffer the evaporation of water and lose 25-40% of their weight. It is a very rigorous technique, and wines produced by this method are typically expensive. The grape bunches are carefully selected (only perfect ones will do) and hand harvested, and transported in a single layer to the winery. They are then laid out on bamboo mats in special sheds or barns which are increasingly equipped with dehumidifiers. The first two weeks are critical, as rot can set in, and ruin the entire vintage. Fermentation traditionally starts up in the winter, and is always difficult to get going given the sugar level of the must and the cool winter temperatures. I had mentioned earlier about the importance of Rondinella in the production of Amarone. It is particularly important for dried grape wines because it has berries that are smaller than Corvina, and dry faster, reducing risk for the producer. So, here we have semi-dried grapes, and we are making wine. Everything has been concentrated, and the cool weather has made it hard to even get a fermentation going. The yeast is challenged during the entire process. When you have high sugar levels, you can get a “stuck fermentation” (where the sugar wins, and the yeast dies off). In this case, you are left with a lower alcohol wine and residual sugar. These wines are known as “Recioto” (Italy’s answer to Port). But, when the yeast wins, the sugar is converted to alcohol, and we have “Amarone”. Because of the drying-process, Amarone is a high-alcohol, high-extract wine. The lowest alcohol versions will start at about 14% (the minimum, by Italian law) and 14.5-15% is common; some, however come in above 15% and even as high as 17% (similar to Zinfandel). The best versions of Amarone have intense cherry/kirsch aromas and an earthy complexity. Roasted flavors, raisins, caramel, coffee, chocolate, tar, barrel-spice are common descriptors. Amarone ages well, but in the highest alcohol wines, they occasionally run the risk of drying out, and losing all fruit notes. The Italians consider Amarone to be a “meditation wine”, the perfect complement to old cheeses like as Parmesan and Aged Gouda, and to rich blue cheeses like Gorgonzola. In America, we tend to drink wine with a meal, and it can be a great companion, especially to dishes whose preparation is similar to the production of the wine itself, such as long, slow braises of beef and game. In my interview with Grape Encounters, David mentioned that he had found a wonderful bottle of Amarone at Trader Joe's (he didn't mention them by name, but it was pretty obvious) for around $20. Considering that most Amarone is $40 to $80, it might be worth checking out your local TJ's. So, are you ready to explore and try something new? I hope you'll share your tasting experience. One of the best parts about being a Sommelier has to do with the events I am hired to work. Recently, I was hired for a corporate event, where they needed wine for three separate activities: a boat tour of Lake Arrowhead; a sit down dinner; and in between a wine tasting. While I stuck with more familiar wines for the boat tour, and the dinner pairing...the wine tasting gave me an opportunity to have the group try something a little different. I was a bit constrained in what I could do for the tasting, as the event organizer asked me to keep to domestic wines, and ideally keep to California. 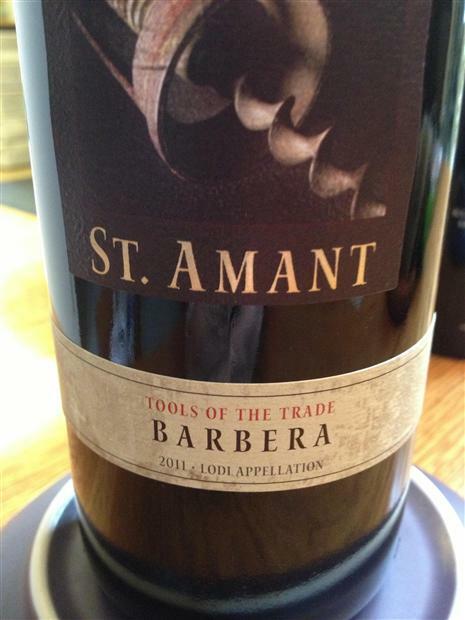 One of the wines in my five wine progression was St. Amant Barbera, from Lodi. At less than $20/bottle, this was the one wine that generated the most discussion. While I had many people who knew their wine, I had a similar number of people that weren't experimental, and stuck to their usual. But, not this night! As I usually do during tastings, I spend time talking about the grapes, the wine, and region,etc. I would guess that 90% of the tasters had never had a Barbera before. I can't tell you how many times I had to explain that Barbera was the name of the grape, just like Cabernet Sauvignon is the name of the grape. So, I thought a quick recap of what Barbera is, might be something to "push" those of you unfamiliar with the grape, to give it a try. First, Barbera is a red grape, typically seen in the Piemonte region of Italy. 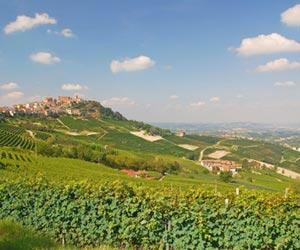 This region is most noted for Barolo and Barbaresco (both made from the Nebbiolo grape). But, Barbera makes a very reliable, easy drinking red wine, with a high amount of acidity, deep red color, and cherry flavors. 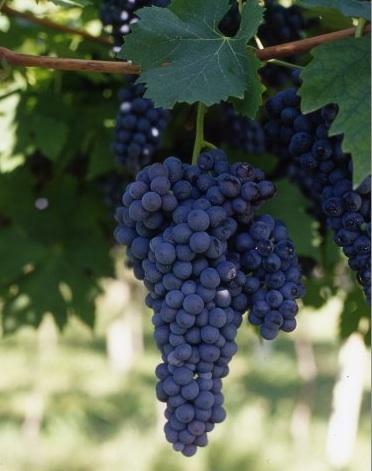 Barbera is the third most planted grape in Italy (behind Sangiovese and Montepulciano). In its' home in Piemonte, the grape gives it's name to the Barbera d'Asti DOCG (the highest level in Italy), as well as Barbera d'Alba DOC and Barbera di Monferrato DOC. 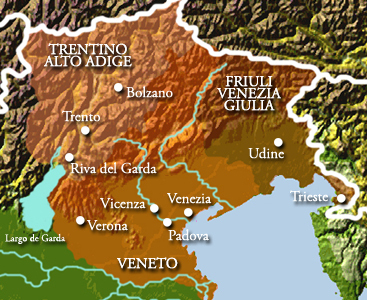 In these regions, Barbera is known as a productive grape, which ripens fairly late, while maintaining its' acidity. As we've seen with another grape (Zinfandel) in California, the Italian influence is evident. Italian immigrants brought their vine cuttings with them, and the foothills of the Sierra Nevada mountains proved to be a perfect location to grow the grape. Now these old vines are producing some wonderful wines (of course a lot depends on the winemaker too). 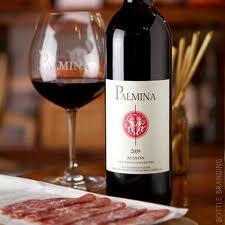 As mentioned earlier, Barbera can be a fairly acidic wine, making crisp, medium body, fruity wines. New techniques, including oak barrel aging have helped soften the wine, and make it more complex, if not a bit more conforming to today's tastes. These wines can be appreciated in their youth, and don't require the long aging needed for their Nebbiolo counterparts. The acidity, and low tannin structure of the wine makes for a nice warm weather wine, that can be slightly chilled (yes, you can chill red wines...just not too much). As I have discussed in my wine pairing articles, acidity works great with food. For that reason, Barbera might just become one of your "go-to" grapes. Try it with barbecue (pork, chicken, hamburgers, really any grilled meat will work). That acidity works great with tomato based sauces and pizza (who woulda thunk?). About the only thing it might not work with would be light, delicate fish. Oh, and about that St. Amant Barbera...it had a nice amount of cherry, blackberries, a touch of spice (maybe licorice) and tannin from some oak aging, while retaining that all important acidity. A nice finish with medium length. Not a wine that you'll want to store too long. Very approachable now. Some other Barbera producers in California that are worth searching for are Cooper Vineyards, Palmina, and August Ridge. There are plenty more, but these are wines that I have tried, and enjoyed. It's already been a busy wine season. Lots of bottles served, consumed, and enjoyed. But, what do you do when the wine is gone? "Panic" is not the answer I was considering. What I was thinking about is what do you do with the packaging the wine came in? If it is a box, then you're probably reading the wrong blog. I already have about 50 bottles sitting in my wine room, waiting for their final usage. If the label is unique, I set the bottle aside for further "processing". My routine is to save the cork, for my cork tower, remove the label for addition to my wine table collage, then recycle the bottle for some money that goes back into my wine purchases. Do any search online, and you can find hundreds of ideas for the crafty people out there. Some of my favorite ideas involve the use of corks. I simply put them in a glass tower, as a decorative piece in my wine room. 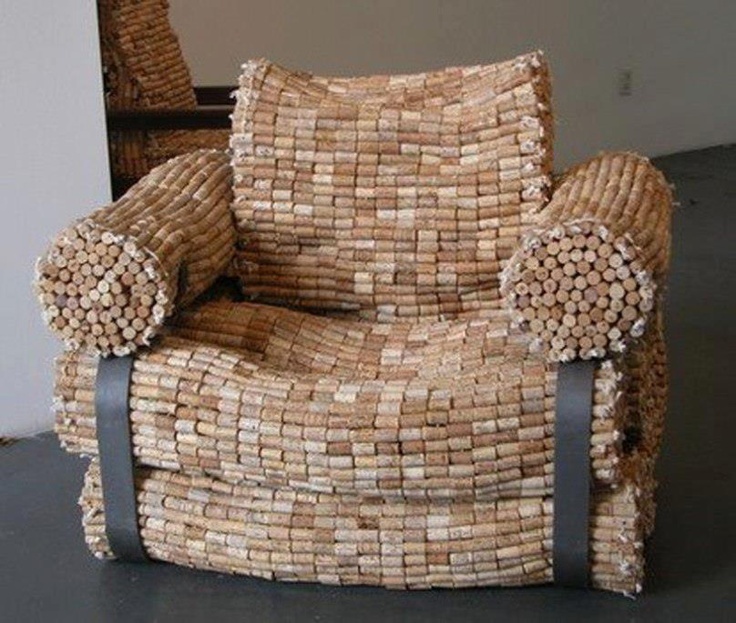 Cork is a recyclable material. It takes a cork tree about 25 years to regrow it's bark (cork) for a new harvest. It is a biodegradable material. There are only a handful of recycle centers for cork (and it cannot be used again in wine bottles due to bacterial concerns). So why not create something with them. 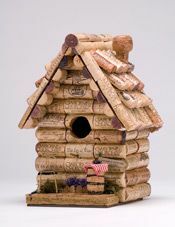 On Pinterest, I have seen a lot of clever ideas: cork boards, shower mats, key chains (I have one on my wine cabinet), birdhouses, and in one case, an entire floor covered with half cork rounds. When I was younger (before the advent of recycling) wine bottles offered all types of projects. I used to have a glass cutter, and would cut the bottle in half, file down the edges, and make glasses. The tops could then be used for making wind chimes. My parents would drink the cheap Chianti that came in the fiasco (wicker basket). 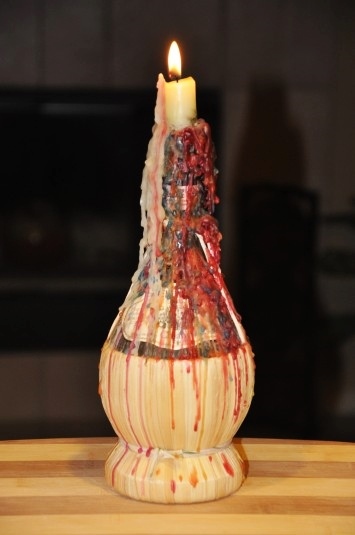 We'd add different colored candles, and let them drip down the bottle, creating the quintessential Italian restaurant decoration. Lately I have been seeing some creative ideas where clear bottles are filled with popcorn kernels, or rice, and used as decorative pieces in kitchen. I've seen them used as lights, chimes, cemented in the wall of a building as colorful decorative windows. I'm not that creative...I take my empties to the recycling center, and use the money for my future wine purchases. But, before taking the bottles to the recycling center, I remove the labels. There are some really artistic labels out there, and there are wines that I want to remember. It used to be that steaming the label, or soaking it in hot water, was the only way to loosen the glue's grip, and remove the label. This often left a messy label. Now I use a label savers from Wine Enthusiast. These are basically clear plastic with adhesive on one side. You rub the plastic onto the label, then peel off. It works about 9 out of 10 times. 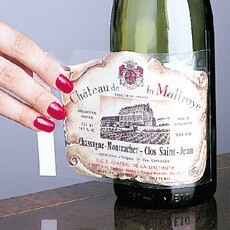 My labels are then put on my wine table, in a collage, and covered with a glass top. I can look at them, reflect on the time, taste, and experience of the wine, every time I sit down for a glass of wine. I have also seen some nicely framed wine labels. You could also create a scrapbook with the label, and tasting notes - now that would make a nice coffee table book, wouldn't it? So, I ask you once again, what do you do when the wine is gone? This week, I have chosen to use someone else's information for the blog. Time to take a short break, and celebrate our country's independence. Since this is a big barbecue weekend, here is a link to my past article on BBQ wines.